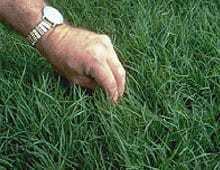 Bermudagrass can be used for home lawns, commercial sites, parks/recreation sites, erosion control and is the primary grass used for golf course and athletic field turf. Bermudagrass can be used alone but is commonly used in conjunction with other warm season and cool season species as part of erosion control mixes. Bermudagrass, Cynodon dactylon (L.) Pers., is a highly variable, sod forming, warm season turfgrass that spreads by stolons and rhizomes. 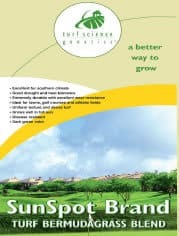 Growing best in full sun, Bermudagrass is adapted to a wide range of soil conditions. Bermudagrass is both persistent and aggressive with excellent heat, drought and wear tolerance. It has medium to fine leaf texture with a light to medium green color, depending on the variety. There are several improved seeded varieties currently available with dark green color, fine leaf texture and high density. Major improvements in cold tolerance allow new varieties to be grown further north. Bermudagrass is adapted throughout the southern and transition zones of the United States. However, recent advances have resulted in new varieties with improved cold tolerance which allows it to be grown further north.